This is a great route that can start and finish on Saganaga Lake either with or without a tow boat ride to American Point. If you only have four days it would be best to get the round trip tow so you can get into Cherry Lake on the first day and out of Cherry and back to Sag on the last day. Some people set out for Cherry but find a site on Ester or Hanson and just take a day trip to Cherry. It’s a great area for a base camp because there are a number of other lakes you can visit from this location. It would be great to have a full week to enjoy the area to its fullest. With a tow boat ride we can take you to American Point on Saganaga which is as far north and west as motorboats are allowed to travel into the BWCA. From there it’s paddle power only as you make your way west along the Minnesota Canadian border. The paddle from American Point to the first 5-rod portage into Swamp Lake is relatively short but very scenic. After paddling past the opening to Cache Bay of the Quetico Park the waterway begins to narrow. It eventually funnels down to an intimate stream like size as you straddle the narrow waterway with the bow of your canoe in the US and the stern in Canada. The waterway opens up again before the 3rd Bay of Saganaga where there’s a 5-rod portage into Zephyr Lake but you’ll continue along the route to Ottertrack Lake. The bay of Ottertrack where the portage leads to is shallow and sandy. I love this area because you can see to the bottom and one time I was able to spy a beaver swimming beneath my canoe. The lake begins to open up and this is where you will find the 80-rod portage into Ester Lake. The portage is well-used and begins with an uphill climb. Portions of the path are strewn with rocks and there are areas that are muddy but it’s not too bad, especially when you compare it to the portage from Hanson to Cherry. You will paddle through the narrow gap to get into Hanson Lake where you’ll find the portage into Cherry Lake. The 110-rod portage into Cherry is long and rugged and begins with a steep climb before leveling off. This portage, along with many others in the BWCA used to have canoe rests and I recall one being at the top of this hill. Starting wtih a hill always gets the heart pumping so it was nice to be able to take a breather without having to flip the canoe off and put it back on again. You could just walk underneath and prop the canoe on it with relative ease. You won’t find a canoe rest anymore but that doesn’t mean you can’t rest. Cherry is a beautiful small lake with some magnificent cliffs lining the north shore of the lake. They rise up out of the water about 100 feet and you can hike to the top of it via a trail beginning at the campsite in the middle of the lake. Both of the two campsites are terrific and you’ll see far fewer people here than you would if you were to camp on Ester or Hansen. The 110-rod portage keeps the riff-raff out. There are so many day trip options to choose from when you’re camped on Cherry. You can make a loop paddling into Topaz, Amoeber, Knife, Ottertrack, Gijikki, Rivalry, Lake of the Clouds, Lunar and back into Cherry. It’s an easy 5 rod-portage from Cherry to Topaz where you’ll find one campsite and fishing for lake trout and smallmouth bass. A 20-rod portage takes you into Amoeber Lake that also has two campsites and fishing for walleye, lake trout and smallmouth bass. The campsite on the island in Amoeber is a great place for a picnic lunch or to take a quick dip. Another 20-rod portage takes you to Knife Lake and if you have extra energy and there isn’t a strong wind from the west you might want to head to Thunder Point. There’s a hiking trail that leads to the top of this and you’ll have a great vista of Knife Lake including Isle of Pines where the Rootbeer Lady lived. The portage into Ottertrack is a quick 5-rod lift over with the water spilling into Knife Lake. You might want to have a picnic lunch at the campsite and try casting into the moving water. All four of the main species are found in Knife Lake as well as in Ottertrack. It’s a pretty paddle through the narrow winding part of Ottertrack. You’ll pass some beautiful campsites before you reach the tough 50-rod portage into Gijikki. The length of the portage isn’t bad but the uphill climb will make you happy you don’t have all of your gear along with you. Gijikki is a pretty lake with two campsites, one on an island in the middle of the lake. You can try your luck for catching lake trout from this deep and cold lake. You’ll paddle across the lake to the 35-rod portage into tiny Rivalry Lake from where you’ll take the 75-rod portage into our Voyageur Crew favorite, Lake of the Clouds. When you’re on Lake of the Clouds you feel like you are in the clouds because it’s at the highest elevation of all of the surrounding lakes. You’ll take a short 10-rod portage into Lunar Lake, referred to as Moon Lake on a 1964 DNR map. There are lake trout in both Lunar and Lake of the Clouds if you want to wet a line. Then it’s a 45-rod portage back to Cherry Lake where you’ll see a tiny waterfall emptying into it. If you’re willing to take the 110-rod portage back into Cherry there are a few options to choose from for day trips. From Hanson Lake you can explore the Pitfall Lake PMA accessed from the east side of the shoreline. This is a Primitive Management Area that requires a special permit from the USFS to camp overnight in. Very few people travel and camp in these lakes and the portages aren’t well maintained. You’ll want to have a map and compass with you for navigation and a fishing rod because there are some hungry northern pike and a few smallmouth bass that don’t see too many fishing lines during the year. There are a number of lakes to explore including Link, Bullfrog, Pitfall Lake, Gift, Nawakwa Lake , Faith, Midas, Cup and Fish. If you want to read about Mike’s trip into the PMA you can check out the article in Backpacker Magazinewritten by Gustave Axelson. Another option for a day trip is to paddle into Ester and take the 55-rod portage into Ashdick Lake, previously called Caribou. There are two campsites to choose from for a picnic, a rugged portage that leads to Ottertrack Lake for a hike and fishing for northern pike and the “rare to find in the BWCA” largemouth bass. Back on Ester you can look for a trail to the top of the cliff on the northwest portion of the lake not too far from the portage. It offers a chance to stretch your legs and a nice view. There’s a 15-rod portage into Rabbit Lake that has two campsites and fishing for lake trout. Make sure you take the time to hike the portage from Hanson Lake to the South Arm of Knife Lake. It’s a gorgeous 120-rod portage with water running alongside it. If you carry your canoe you can explore the islands and bays of this large area or choose to portage into Toe Lake, Eddy Lake or beyond. Ottertrack Lake previously known as Cypress Lake is a gorgeous lake with towering cliffs on the Canadian side of the lake. It also has the homestead site of Benny Ambrose, the last man to live in the Boundary Waters Canoe Area. His homestead can be found right in the bay after you come out of the narrowest point of the lake. There is also a plaque on the face of the cliffs on the Canadian side of the lake. There’s some terrific campsites and fishing for all four species. Just remember to stay on the US side of the lake. Benny Ambrose was the last man allowed to live in the Boundary Waters Canoe Area Wilderness. He established a homestead on Ottertrack Lake in the late 1920’s and lived there until his death in 1982. He was born in Iowa and at age 14 when his dad-remarried he ran away from home. His dream was to pan for gold in Alaska but he needed to earn some money before he could venture north. He took odd jobs in the Midwest until 1917 when he enlisted during WW1. He met an Ojibway man from Grand Portage who told him about the beauty of northeastern Minnesota and about the chance to explore for gold and other mineral deposits there. When he was discharged in 1919 he first went to Hovland before making his way up the Gunflint Trail about a year later. On the Gunflint Trail he prospected, took odd jobs and made friends with the Ojibway who taught him skills of hunting, fishing, canoeing fur trapping, snowshoeing and surviving long winters. He didn’t have a home he just pitched a tent or stayed in empty trapper cabins. He guided fishing trips for the resorts on the Gunflint Trail then moved to Ottertrack in the late 1920’s. He spent winters trapping in the frigid cold sometimes out for days at a time. He guided fishing in the summers and tended to his garden which he created by hauling muck from beaver ponds and black dirt from Iowa. In 1937 he met and married a woman who he promised he would build an actual cabin for. Two kids and about ten years later his wife left him so their girls could have a normal life with friends and school. His daughters would continue to spend summers with him at Ottertrack. Meanwhile the government was busy drawing boundaries, making rules and establishing wilderness areas that included Benny’s homestead on Ottertrack Lake. In 1909 the Superior National Forest was created followed by designating 640,000 acres inside of the forest as wilderness in 1926. In 1938 the Superior Roadless Primitive Area was established and in 1948 Congress passed Thye-Blatnik Act to buy resorts and private lands in the wilderness. 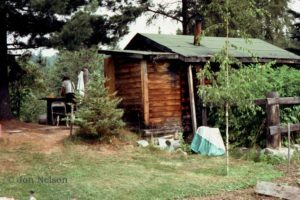 The Wilderness Act of 1964 said all homesteads in the BWCA had to be surrendered to government and all man-made structures removed by 1975. The USFS thought by 1975 Benny would be ready to leave his home on Ottertrack but that wasn’t the case. 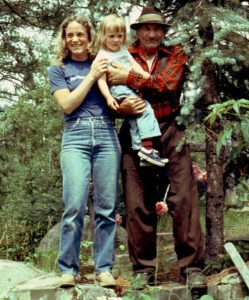 They threatened condemning his structures and evicting him but his relationships with powerful people and publicity his storiy received kept the USFS from doing anything to remove him from the wilderness. Instead they designated Benny as a federal wilderness volunteer so could live out his life on Ottertrack. Most of the information above can be credited to an article by Ralph Wright-Peterson. You can read it in full here. I’ve camped on Cherry a few times and one of the times it was with a group of women. There were five of us and we enjoyed our time lounging in the water and visiting around the campfire. One night they said we were having ham, potatoes and carrots for dinner. I assumed they had found some kind of freeze dried ham along with freeze dried vegetables. Imagine my surprise when they pulled out a whole fresh ham along with a dozen fresh potatoes and eight or so full-sized carrots. It was one of the best meals I’ve eaten out in the canoe country and the leftovers were used for soup the next day. As an outfitter I’m always worried about packing light but on this base camp the weight of the packs was not a factor even though we had considerable portaging to do. The good news is I didn’t have to carry the food pack on the way in or on the way out.